KAG: A castle was attacked by the demon birds. There is some secrets that Naraku is hiding there. 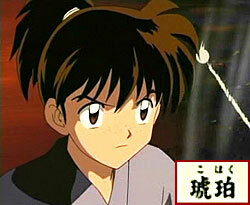 Then, from the people that are being attacked, Sango's brother, Kohaku, appears. While Inuyasha is battling Princess Abi, Sango and Kohaku started fighting too! Next on Inuyasha, "Fate is a Cruel Reunion". I don’t care if I die… Even if I were to lose my life, I’ll kill him!